This fabulous blossom is glorious in the garden throughout the summer. The Latin name includes “officinalis” meaning “used in medicine.” Though called a marigold, it is part of the sunflower family. It is an annual that grows from 1 – 2 feet high with bright orange or yellow blossoms. How is this flower used? The petals are edible and add a beautiful splash of color to a summer salad. It has a slightly “saffron” like taste; hence it has a folk name of “poor man’s saffron.” The petals can be used as a dye for fabric and will give a yellow tint to creams and salves. 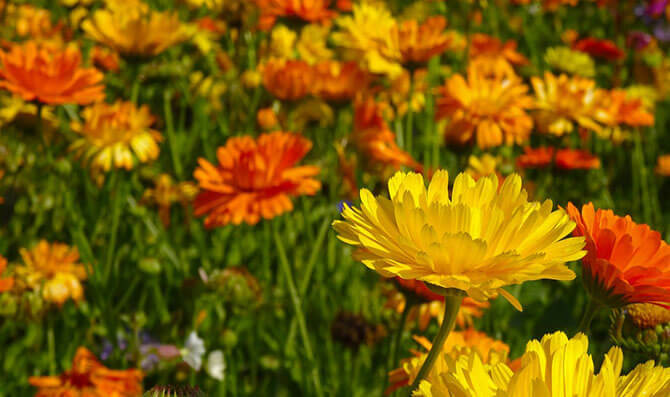 Calendula oil or salve is a must have in any herbal first aid kit. According to Culpeper, a renowned 19th-century herbalist, calendula could strengthen the heart, would sooth the eyes and prevent infection in wounds. Used internally is it excellent for digestive inflammation and may be effective for ulcers. It is a great diaper rash ointment. External “ulcerations” like eczema or psoriasis may also be soothed by this healing plant. Steeped in warm water it creates soothing eyewash. Use muslin or organic cotton soaked in the tea to wash the eyes or skin. It anti-inflammatory, anti-microbial, anti-bacterial and soothing, so is an excellent choice as a medicinal oil, in salves, and in creams. Let it sit in a tightly sealed jar in a dark cupboard for 2 weeks. Strain the oil from the blossoms. Add essential oils to personalize. Calendula is a magical plant. It is lovely, creates an attractive border plant and blooms all summer long. Growing this plant in your garden between other vegetables creates natural pest control. The strong aroma helps keep many bugs at bay. Try planting it between your greens, tomatoes, spinach, and lettuces. I find this plant extremely useful. I keep the infused oil on hand at all times and use it to create my CalendulaBlossom Cream. It is great for extra dry places like elbows, knees, or for dry cracked heels. It is nourishing and soothing and helps to prevent infection! I hope you are inspired to find a place for this beneficial lovely in your home and garden.